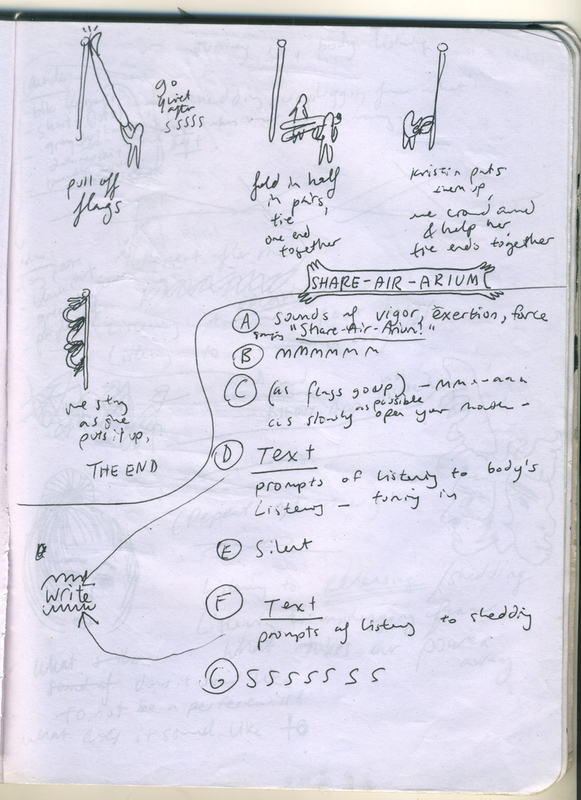 STNDRD presents Solid Air by Kristin Abhalter Smith. 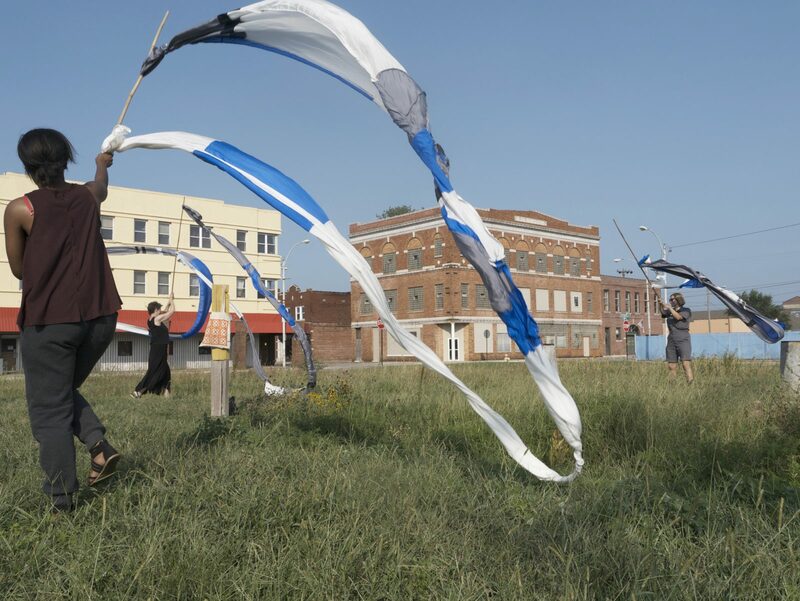 This two-part project includes the creation of ceremonial flags accompanied by a public spectacle to activate the site. 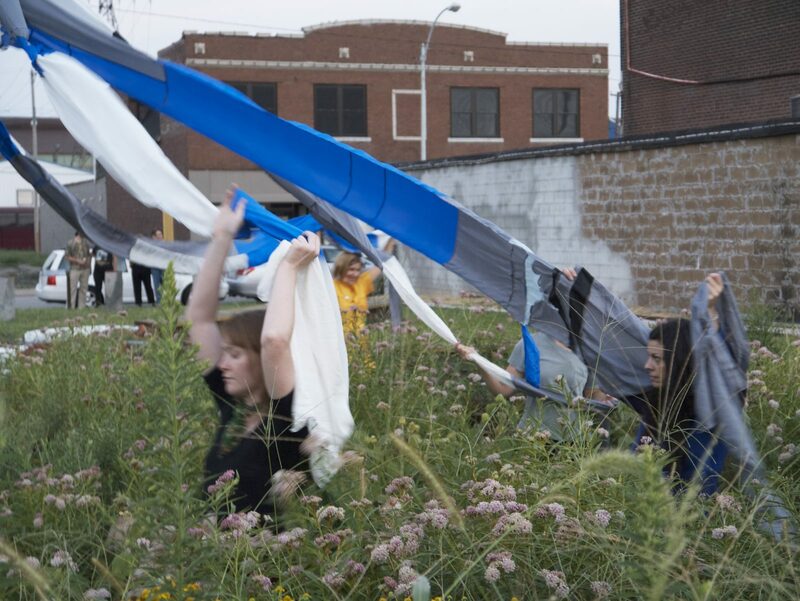 The performance is a collaboration between Kristin Abhalter Smith and Gwyneth Zeleny Anderson including participation by the artists Amanda Bowles, Rachel Herman, Andrea Freeman, and Amelia Jones. Solid Air is imbued with the actions and words of a ritual that manifests energetic transformation. Change is continual, yet transformation can be witnessed through observance of tangible residue such as the shedding of a snakeskin or the ephemeral setting of the sun. Pieces of china silk, once used as marching band flags, re-configured with dressmaking techniques become ritual objects in this evocative spectacle. Six streamers, each double the length of the STNDRD flagpole wrap six women who are the instruments of change. 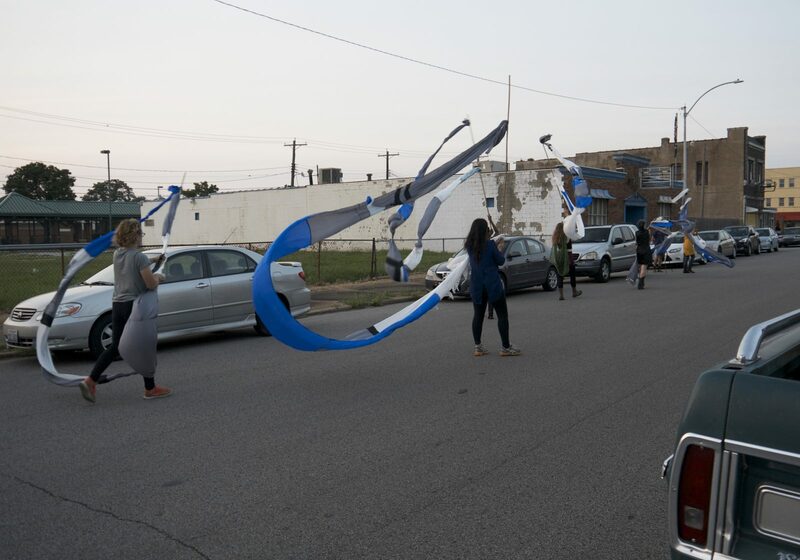 The women help each other shed their wrappings and attach them to bamboo sticks for a parade down the street in Granite City, passing by a crowd that is participating in another transformation ritual as artist Cam Fuller invites others to demolish his undrivable truck with a sledgehammer. The percussion of the busted metal propells the momentum of the spectacle which continues down the block to the site of the flagpole. The movements of the women propel the streamers through the air and the site is filled with color and form and the intention of energetic transformation. 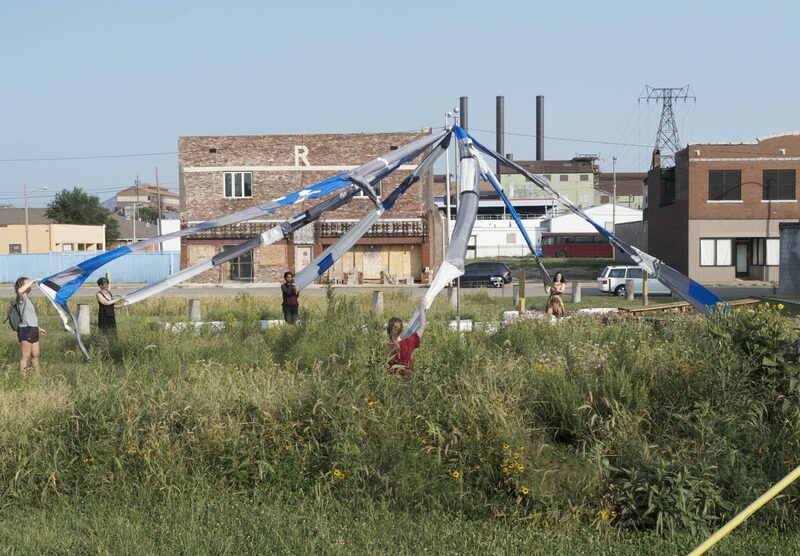 The streamers are then attached to the flagpole and the women stand at the foot of the pole, holding the flags in the air as they perform Gwyneth Zeleny Anderson’s call-and-response text in which they invoke active listening to the sounds of the space around them: the sound of the air, the sound of the earth below them, the sound of those in this world who are yearning for change. 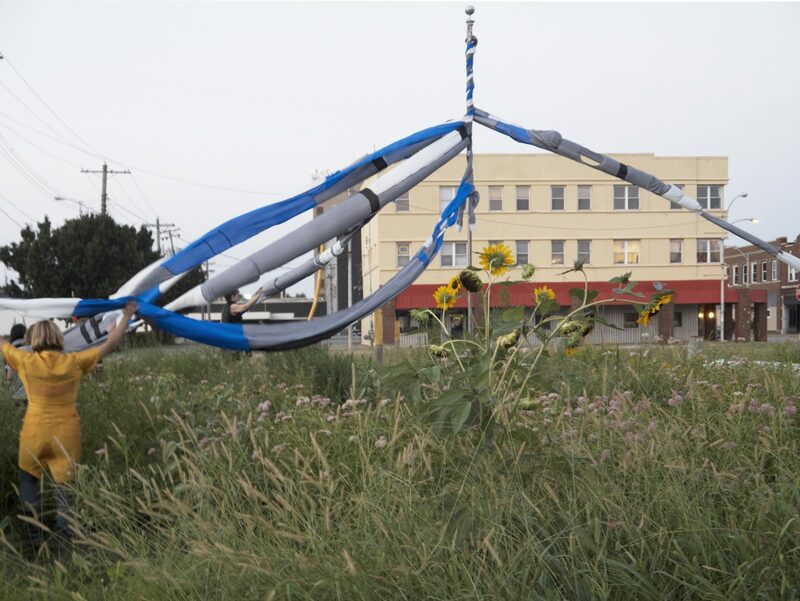 The pole is wrapped clockwise as the women walk through tall grasses and wildflowers surrounding the pole, and another text is spoken before the pole is unwrapped. This unwrapping is not easy, as the group of women struggle to remove part of the fabric which has become snagged on the flagpole hardware. This struggle continues while the women hiss like snakes in mutual encouragement before managing to unravel the fabric once again so it can be bundled loosely and tied together, symbolizing unity, and left to blow in the wind for two months as a reminder of the work we must do together to bring about desired change. 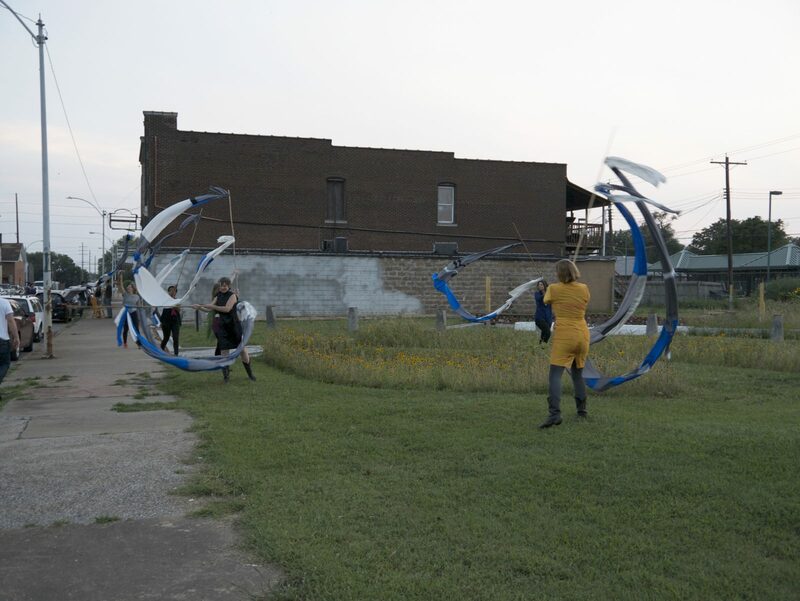 Kristin Abhalter Smith creates opera-informed installations and performative objects inspired by the production of theatrical events. She has an M.F.A. in Design & Technology for Theatre from University of Minnesota and a B.A. in Design and Cultural Anthropology from Washington University in St. Louis. 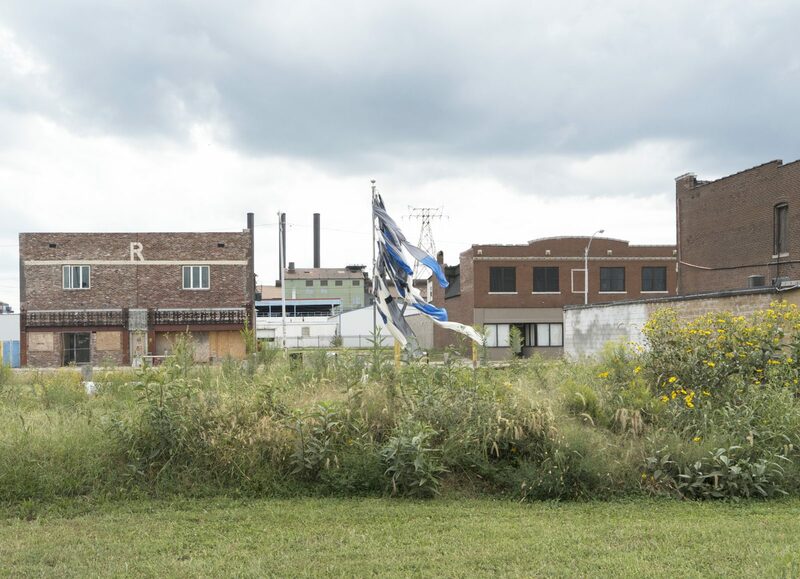 Abhalter Smith has shared artwork at Art on Armitage, For The Thundercloud Generation, Ignition Projects, and Peanut Gallery in Chicago, Demo Project in Springfield, Outcenter in Benton Harbor, Art of This and Art Shanty Projects in Minneapolis. Abhalter Smith is the founder and director of Roman Susan Art Foundation, an art space and platform for exhibitions and events in Chicago. She also designs sets and paints for stage and motion picture. Gwyneth Zeleny Anderson is a depressive animist based in Chicago. She makes time for the animation, absurdity, patterns, and paradox of humans and not-humans, often focusing on sensations and systems that are invisible to us due to their immateriality, proximity, or assumed normalcy. 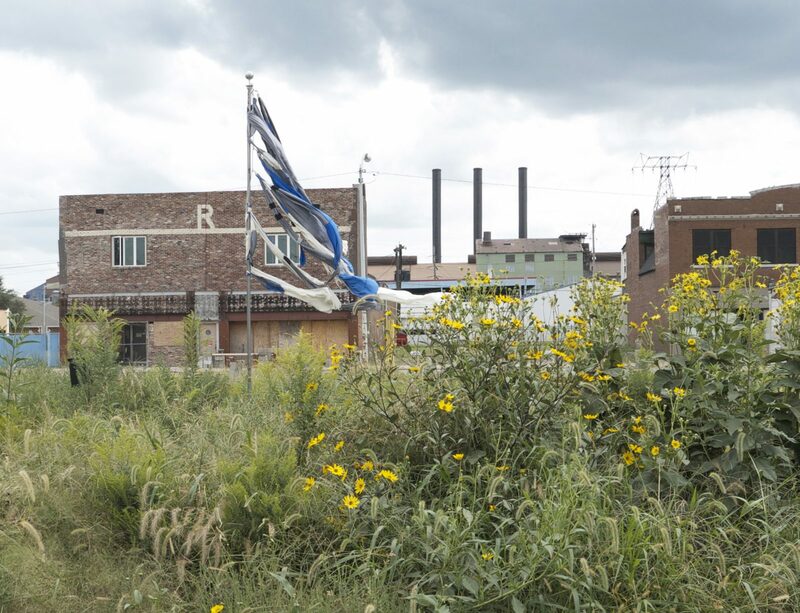 She’s presented work in galleries, festivals, forests, and empty lots throughout the Northern Hemisphere, including with Roman Susan, Roots & Culture, Experimental Sound Studio, Hyde Park Art Center, and 6018 NORTH in Chicago; St. Charles Projects and the Institute of Contemporary Art in Baltimore; MoMA PS1 Print Shop in New York; and FRISE in Hamburg. She holds a BFA from the School of the Art Institute of Chicago, and received her certificate from the Center for Deep Listening in 2018.